This beautifully vintage collection from Couture Creations and Sue Smyth features an amazing selection of colours and illustrations of ideallic flora and fauna perfect for rustic Christmas scrapbooking pages, cards and off the page craft projects this year! This Kitset includes 1 of each Cut, Foil and Emboss Die in Highland ChristmasThis beautifully vintag.. This Kitset includes 1 of each Hotfoil Stamp & Foil Me Stocking Unit in Highland ChristmasThis b.. 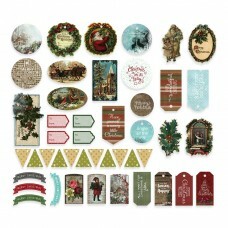 This Kitset includes 1 of each Cutting Die in Highland ChristmasThis beautifully vintage collection .. This Kitset includes 1 of each Stamp and Emboss Stocking Units in Highland ChristmasThis beautifully.. This Kit includes 1 of each Paper Pad in Highland ChristmasThis beautifully vintage collection from ..
304.8 x 304.8mm | 12 x 12inThis beautifully vintage collection from Couture Creations and Sue Smyth ..